“Beep beep beep beep beep” wakes me up. I roll over, its 5 in the morning. That was the painfully loud alarm clock from the macaw team’s room as they wake up to head out on their dawn bird survey. I roll back over and fall back to sleep. A couple of hours later the pressing heat and humidity and the sounds of the Amazon jungle force me out of bed. There are already a few people tucking in to a scrambled egg breakfast lovingly prepared by the resident cooks. I stroll downstairs to collect mine, and then settle down at a table in the caged living area on the upper deck. The fine mesh cage, like a giant mosquito net, protects us from mosquitoes and the other insects that emerge from the forest at dawn and dusk. After breakfast the team begins to prepare for the day’s research activities. Filling water bottles is always high on the agenda, followed by gathering equipment for the various studies, and finally, locating your Peruvian research assistant from the depths of the boat. 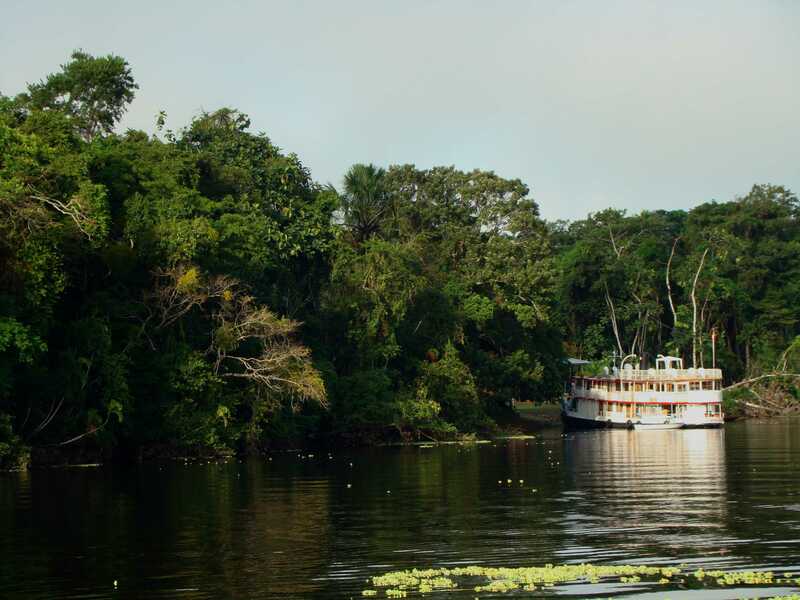 The scent of deet and sun block fills the air and the flapping of life jackets signals the first research groups are boarding the canoes and outboard motorboats before heading off into the jungle. By about 10am you can start to feel the warmth of the sun, and without protection, one may begin to suffer from ‘Canoe-Knee’. ‘Canoe-Knee’: a burning of the exposed thigh above the knee, which is angled directly at the sky, when sat in a canoe. Various studies are taking place throughout the nearby forest. But several studies are also ranging further afield. One study, on the giant river otters takes place more than 1.5 hours boat journey upstream and another study covers ground on foot, heading into the depths of the forest, scouting out troops of capuchin monkeys. A huge selection of research projects requiring much logistical planning occur on a daily basis. Studies on leafcutter ants, fish, freshwater dolphins, frogs and dragonflies take place either before lunch or in the afternoon. Those who are away all day, take lunch supplies and copious water, but usually return by the late afternoon. The tropical rainforest is a tough and challenging environment and your body tells you when it’s time to return for a rest and refuel. Hazards lie on the ground, in the trees and in the water. Armies of tiny stinging ants coat the trees, and subsequently any unlucky researcher that comes into contact with said tree. Biting spiders hang from webs in the understory and bullets ants scuttle along dead logs on the forest floor. In the water an abundance of piranha make fishing a dangerous business and caiman lie hidden on the river banks. Despite these seemingly imminent dangers, if care is taken, then nature tends to mind its own business, a great relief for any human in the rainforest. By late afternoon most people have returned to the vessel and a game of volleyball or football, followed by a cold shower brings the heat of the day to a close. After a delicious, but short-lived dinner darkness falls rapidly, the lights go on and the mesh cage is closed. While most are reaching for their mugs of tea, playing-cards in hand and discussing the day’s exciting wildlife encounters, two groups of researchers are saddling up, life jackets on and boarding the canoes by torchlight. One group are heading up a nearby tributary to collect frogs in the floating vegetation and another downstream, scanning the river with a high-powered torch beam searching for the eye-shine of caiman. …Beep beep beep beep beep. What will today bring?